Candy is one of my favorite things to make. Over the years, I’ve made my fair share of marshmallows, caramel, truffles and toffee. However, where I always struggle is adding chocolate to these delectable treats. It seems like that should be the easiest part- heat up some chocolate and dunk. My experience has not been that simple. Chocolate is a fickle food. Use More Chocolate: You need more than what the recipe requires in order to avoid the scrapping the bowl to cover the final chocolate moment (my biggest downfall). Give yourself enough chocolate to have a good dip by keeping an extra two to three pounds on hand as starter chocolate. Use both the amount suggested and your starter chocolate. When you are done dipping, pour and spread the extra chocolate out on the counter. If you’ve tempered it properly, you can use it as your starter chocolate next time. Dip and Flip: When dipping items in chocolate, it felt right to dip and then slide the tool out. This method results in a mess. Instead, dip the chocolate and flip it so that the your tool is on top. It helps give an even coat. Think about the truffles you see in stores with little peaks artfully on the top…yup, dip and flip. Stir the Chocolate: Chocolate likes to set. To help prevent it from setting, stir the chocolate. It needs to be stirred from the outside in. However, if the outside starts to set, do not include that area in your stir. Be Aware of your Surroundings: That draft in your house? It impacts the chocolate too. Be aware of the temperature changes as you dip. Some methods recommended for the home cook to keep chocolate at the right temperature includes hot pads with linen layering and keeping a warm oven open. Thickness Matters: Ok, first get your mind out of the gutter! We are talking about different types of candy needing different types of shells. Consider the filling and what type of thickness would compliment it. For example, a truffle is great with a thin shell. To create the right thickness, tap on the edge of the chocolate bowl to get rid of excess chocolate (more tapping= thinner). Cool the Chocolate: This one is a little more tricky. Once you are done with the chocolate, you want it to cool immediately. However, if you are somewhere it is hot, that might not happen. Pop the chocolate into the fridge for a couple of minutes. However, don’t leave it in for too long or you may get a sugar bloom. 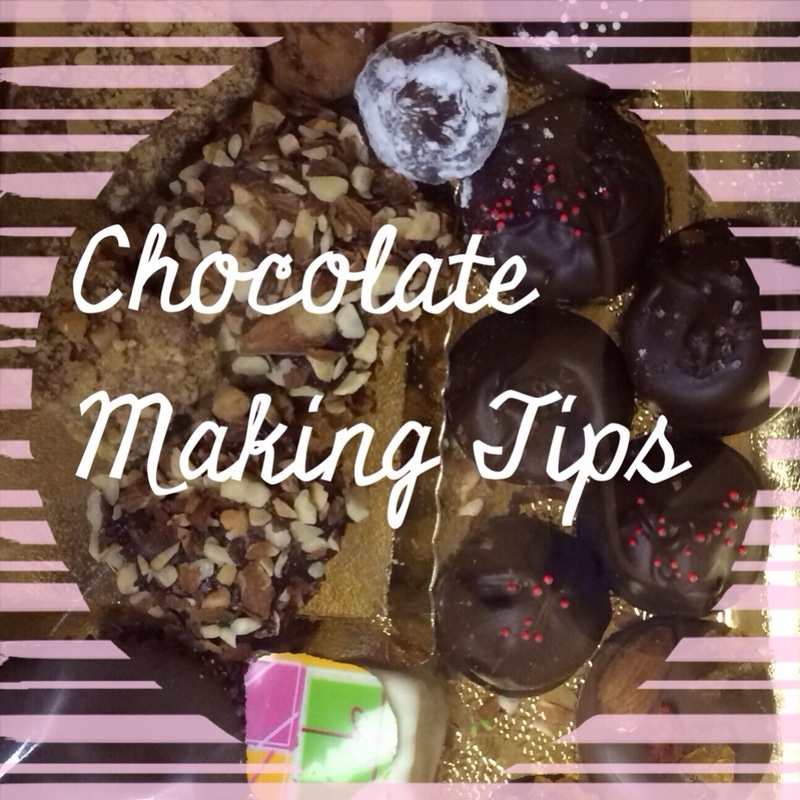 Hope these tips help with your future chocolate endeavors. Happy chocolate making! Ah, the beginning of a year. Those New Year’s Resolutions of last year (i.e. blogging regularly) went out the door. That doesn’t mean I won’t try again this year. I wanted to share a few projects that I did have fun with, so you may see a couple of posts pop up. 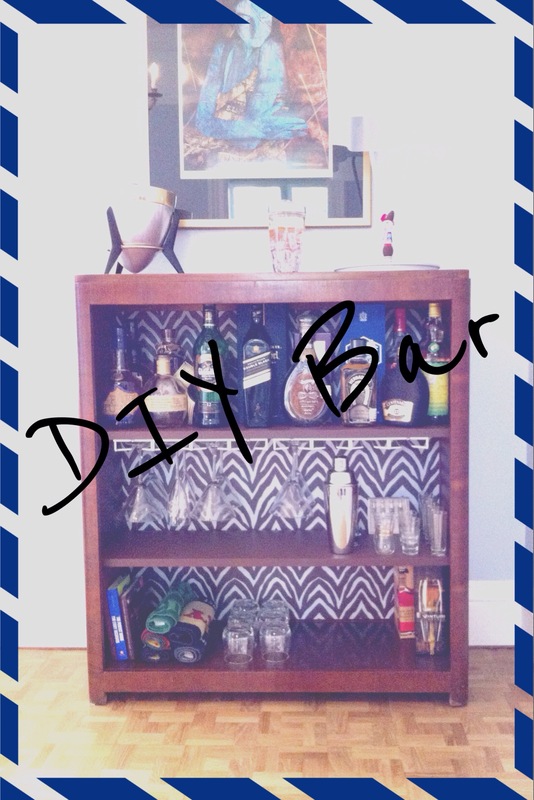 Let’s start with the DIY bar. This project all began when I realized: (1) I was living with someone who had a large alcohol collection that was overrunning a wine rack and (2) the price of a bar large enough to fit the collection was outrageous for the quality/materials being used. Pinterest was a great place for inspiration. One particular post for a mini bar struck my fancy and something that seemed reasonable to do. Without an existing book case, I ended up surfing Craigslist until I found the right piece. I fell in love with a bookcase with rounded corners that reminded me of Mad Men. However, it was missing all of its shelves and the top had some serious water rings. A quick trip to home depot resulted in some new shelves. Plus, they cut the wood to the dimensions I needed for free! Yikes! Look at those rings. After much debate, I decided to refinish the wood surface on the top. The YouTube videos made the process seem so fun and easy. Haha- I was in for a treat. This endeavor required purchasing wood stripper, stain, top coat and specialized tools to apply all of these harsh chemicals. It appeared that the piece had a veener on the top making the whole thing tricky. After spending a half day finessing the top of the piece using the wood stripper, it did not seem to do much. I opted to use fine sandpaper by hand and then gave up and broke out the big gun, the electric detail sander. Luckily for me, the veener layer was thick enough to handle it and the sander worked wonders. The staining and top coat were much easier in comparison. However, being outside was not ideal as little dust particles would blow into the top coat. When all was said and done, the top looked 100 times better. However, in hindsight, for the amount of time it took, I may have gone the route of painting the whole thing instead. With the top all shiny and new, the rest of the exterior needed some love. I happened across a bottle of Feed and Wax product by Howard around the house and it worked miracles. One of the biggest problems with wooden furniture is that it gets dry over time and things like Pledge just don’t cut it. The conditioner goes into the wood and helps it to really shine. The piece of furniture I bought was so thirsty, it needed a few treatments. The results were so awesome I went around “feeding” all the other furniture (yes, I get a little overly excited about cleaning). 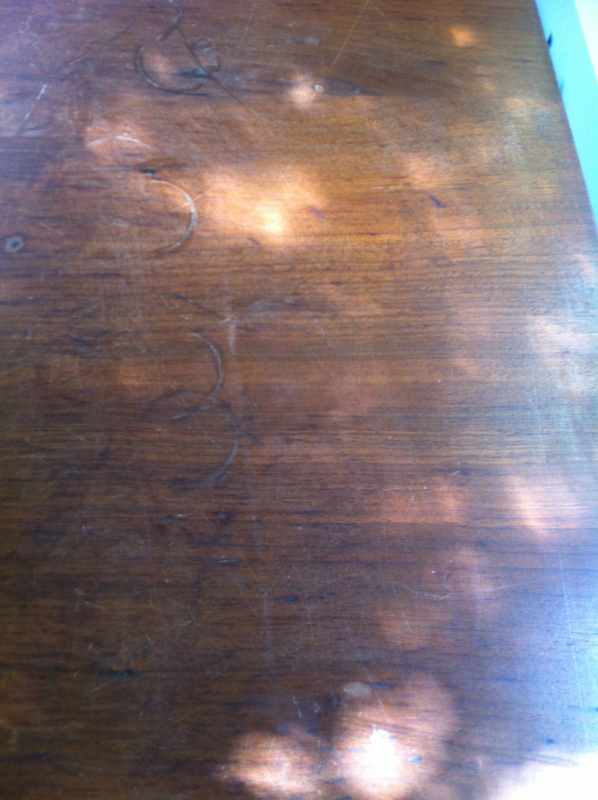 Just be aware that you need to apply it to the whole piece of furniture because it can darken it. You should probably spot check it before going crazy like I did. To the make the piece not look like a bookshelf, I opted to buy some shelf lining paper from Amazon to add to the back. A word of wisdom on this- buy paper that is easy to match. I had to use two different rolls with three strips of it to make it work. It is also best to lay the furniture down when adding the backing. The attempt to stain the new shelves to match the top of the piece failed miserably- mixing wood types does not work! Luckily for me, I scored a free can of paint from Kelly-Moore to celebrate a new paint line. The shelves got a rich chocolate color to match the lining paper. I also purchased wine glass racks at a local building supply shop to hold the martini glasses. Finally, I was able to move all of the alcohol in and sprinkle in accessories like a vintage shaker from my grandparents and bar towels. After all was said and done, I was happy with the end look. Yes, April is almost over and my March recipe is going up. Eeek. I promise that I did make this in March! Passover and Easter came early this year. 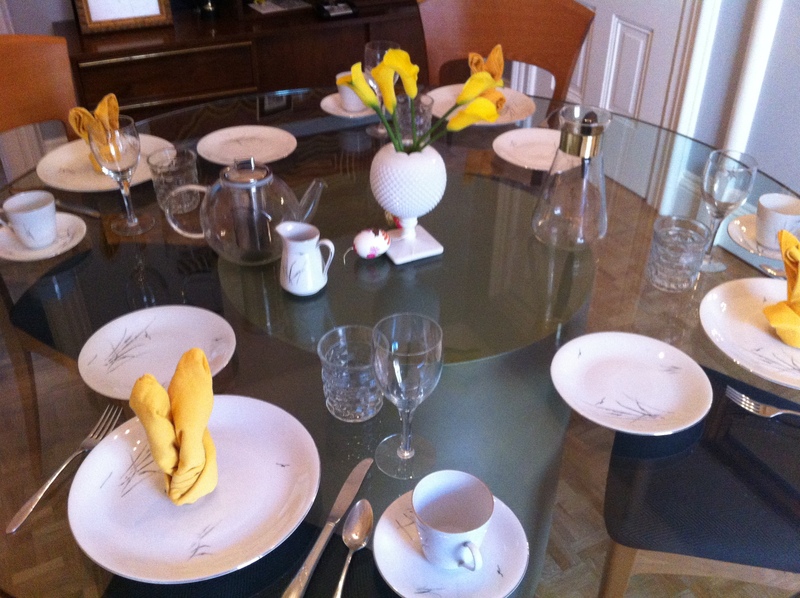 We celebrate both in my household which made for an interesting Easter brunch (more on that later). For Passover dinner I was assigned the task of making dessert. The tricky thing about Passover is that you are not suppose to use any leavening agent. For the record, baking powder and baking soda are two very close friends of mine in the kitchen. 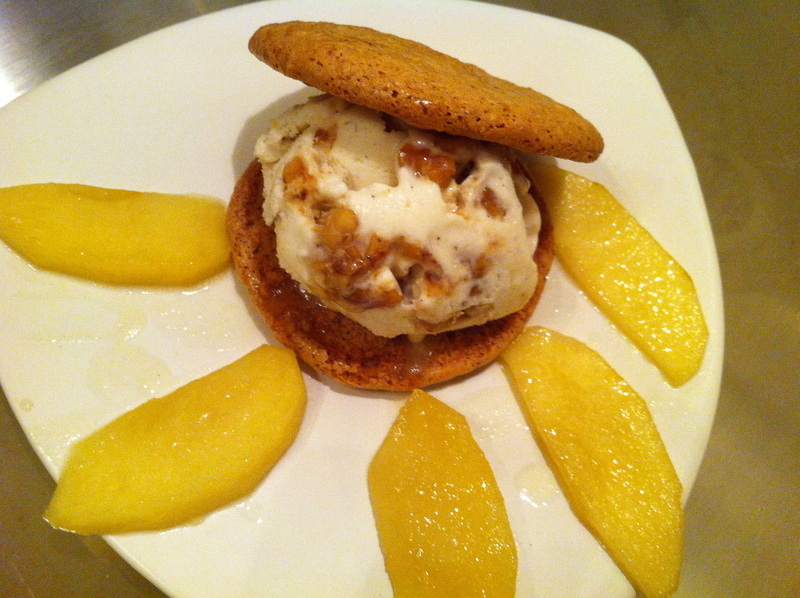 For that reason, it gave me the perfect opportunity to try out a new recipe from Martha Stewart- walnut dacquoises with apples and ice cream. Be prepared to buy a lot of walnuts and honey: These are probably the most expensive ingredients. Watch for walnuts on sale or it may be worth the trip to Costco. Skip the pastry bag: I did not have a tip large enough to use my pastry bag. To skip the headache of running to the store, I put the walnut mixture in a ziplock bag and cut off the corner. It makes for a beautiful clean up. This is also not a recipe where you need a fancy tip. Reduce the butter: I love butter. However, the ratio of honey, butter and apples seemed off. The apples were swimming in the sauce. My goal was to just infuse additional flavor into the apples. I think you could cut the butter and honey in half. It should be noted that I did double my recipe. The ice cream is delicious by itself: This was my first time adding things into store bought ice cream. I did two varieties: (1) Breyers Natural Vanilla and (2) vanilla almond milk (for the lactose intolerant crowd). The honey walnuts added a delicious flavor. I would consider making just the ice cream part again for an easy dessert. It is a rich dessert: Everyone seemed to enjoy the dessert. However, it is very rich. After a big meal it may push you into the uncomfortably full zone. This would be best served with a lighter dinner. 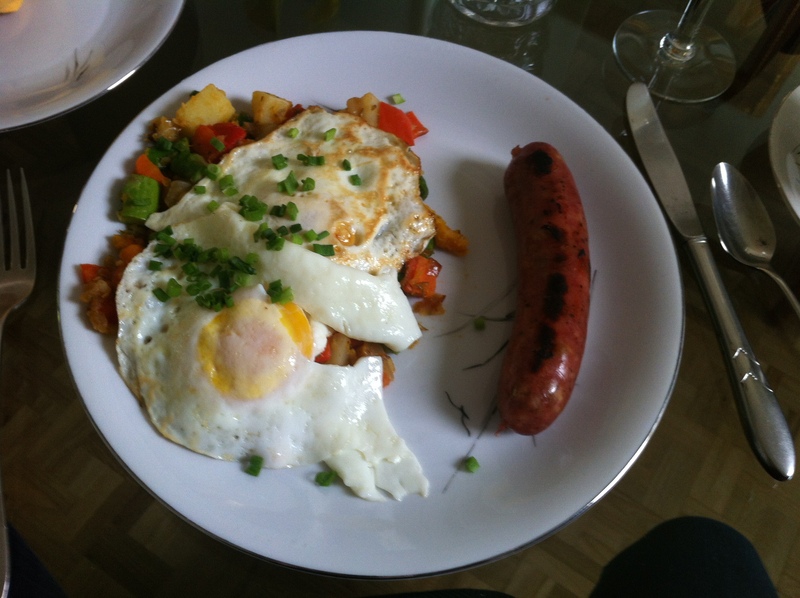 Vegetable hash with eggs: Awesome recipe that makes you feel healthy. I cut down on the potatoes and added some butternut squash to the mix. Chicken apple sausage: Standard Aidells sausage. Homemade fruit juice: Apple and pear. Every week it seems a new service is popping up which is subscription based. Traditional monthly subscriptions have existed for years (e.g. fruit of the month club at Harry & David). However, the buzz about monthly subscriptions seemed to pick up around 2010. Just a few years later, the breadth of subscriptions available leads me to questions what is still left to tackle. Jr. Pooch– clothing subscription for dogs. The descriptions make me laugh. What’s the grand total you may ask? To have a personal experience selected for you every month will come at a price of $203.85 each month (female) or $123.95 each month (male). That is assuming you chose the cheapest subscriptions, don’t have a child or a dog, and don’t like extras. This list is just the services that I’ve heard about. Doing my research, I stumbled across a blog dedicated to this topic that has an impressive directory that you may want to check out. Now the question remains, what subscription service is the world missing? Share your thoughts in the comments. Happy Valentine’s Day! To celebrate the day, I opted to make cupcakes. Strawberry lemonade is one of my favorite treats. I decided that I needed to make it into a cupcake. For the base, I used a wonderful lemon cupcake recipe from the Stir. The cake is a bit more dense than traditional cake. However, it is very moist. For this baking session, I tried using free-standing silicon cupcake holders and a traditional tin. The cakes looked so different! Can you guess which one is the silicon? The silicon is on the left. 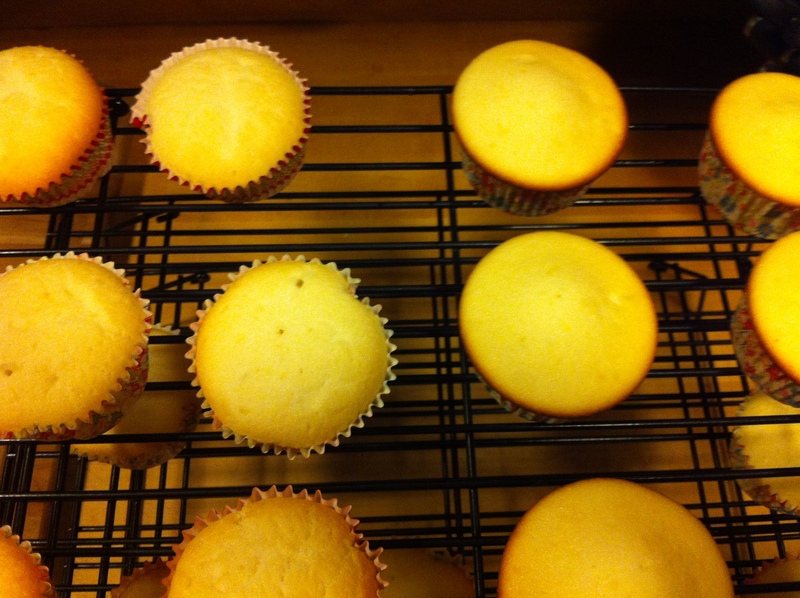 The cupcake liners did not fit well so the cakes had an uneven bottom and one edge popping in. The traditional tin sheet gave the cakes a brown edge from the pan. Overall, I preferred the color of the silicon but the shape of the tin. I may need to invest in a silicon pan that is a solid piece of silicon. 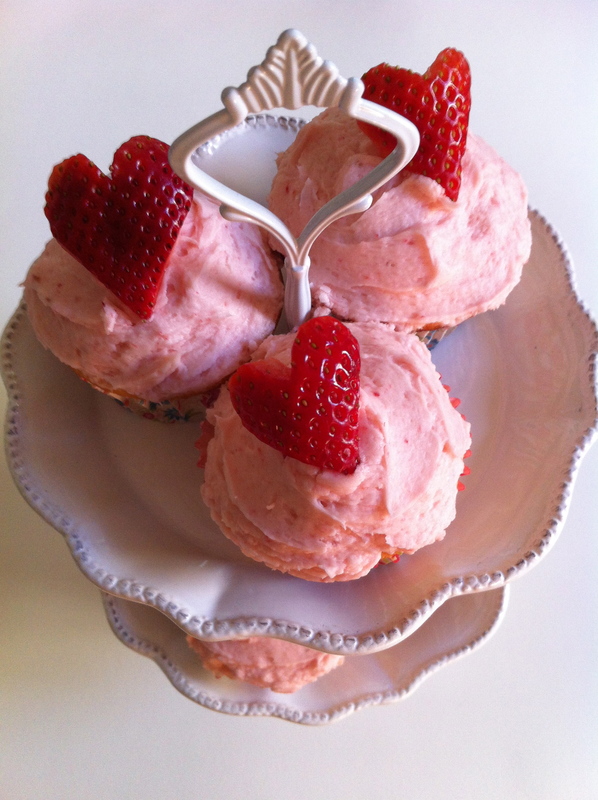 For the frosting, I made a decadent strawberry buttercream from my baking addiction. However, I found that the strawberry flavor was not strong enough. It is most likely because strawberries are out of season. I ended up adding two more tablespoons of strawberries to the frosting with some powder sugar to thicken it back up. After a frosting disaster with my decorating bag, I gave up and went with the old fashion smooth frosting style. I do enjoy the occasional craft project. When I found the adorable rose shaped pine cones in my parent’s yard, I could not resist. 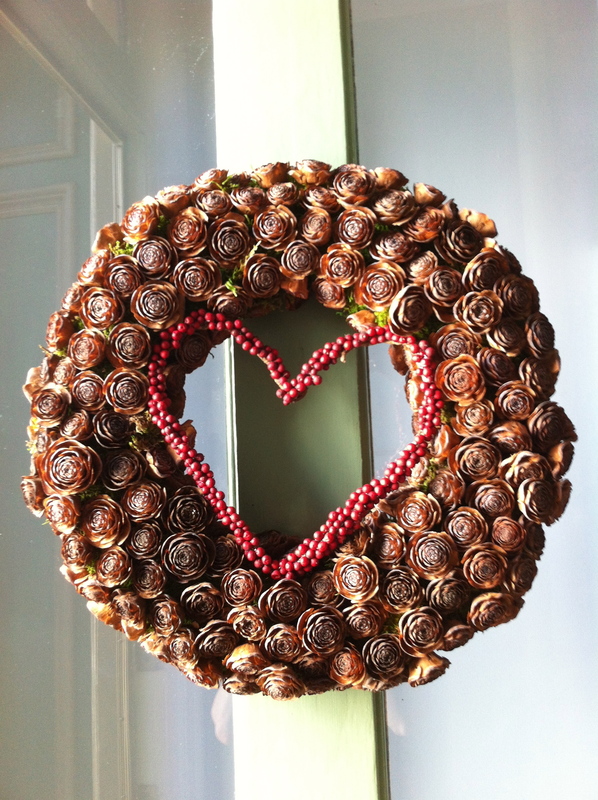 This wreath can be made for Valentine’s Day or just as a winter decoration. You could even paint the whole thing red to look like roses. Add some decoration during the long winter months. Natural wreath for Valentine’s Day. Styrofoam wreath: I used a 16″ flat. However, it was a lot to cover. Hot glue: lots of it! Using the 24 gauge wire cut multiple pieces about 1.5″ long. With your needle nose pliers make a small closed loop at the end of the wire. The loop should be about 1/8″ or less. Make it tight around your pliers. The theory behind adding the loop is it will help to make the bond with the pine cone more secure. The pine cones have a natural hole in the back. It makes the perfect spot to add the wire. Add some hot glue to your wire loop and place it inside the hole. Leave the pine cone upside down to dry. 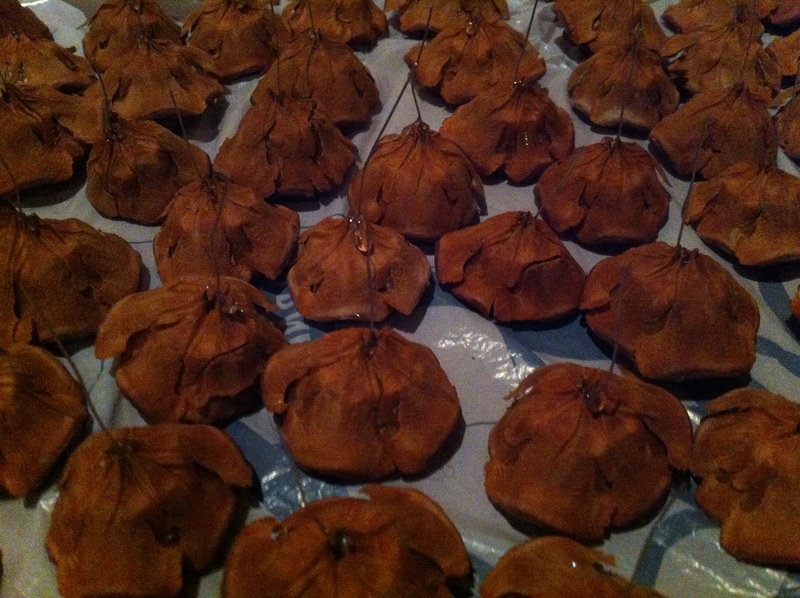 These lovely wired pine cones could now also be used on other projects. Start pushing your wired pine cones into the wreath. Pack them in as tightly as possible to create a fuller wreath. 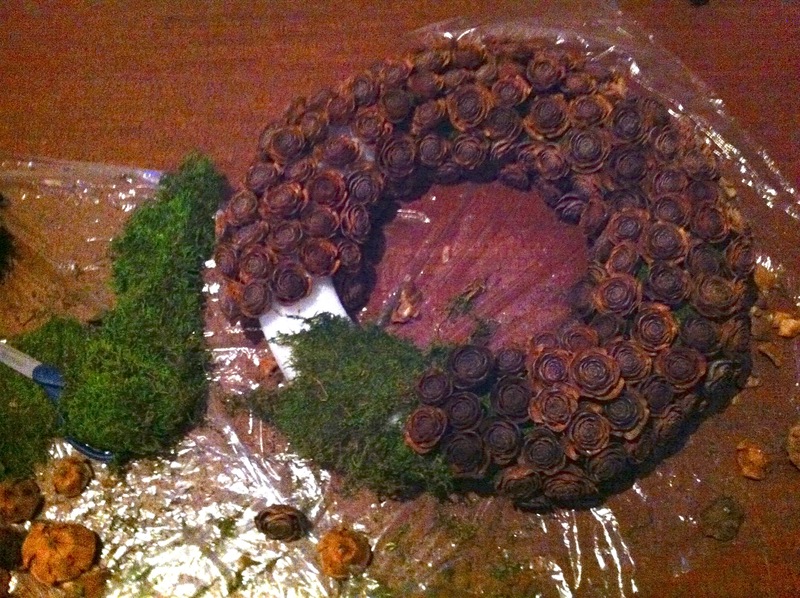 If you are using the moss, the wired pine cones will act as the bond to the wreath. Aim to put the wires at the edges of the moss and through the thicker areas of the moss. Your wreath is now complete as a winter wreath. Add a ribbon to make it festive. This would be the time to spray paint over the pine cones if you are going for a solid look. Continue reading if you would like to add a heart to the middle. 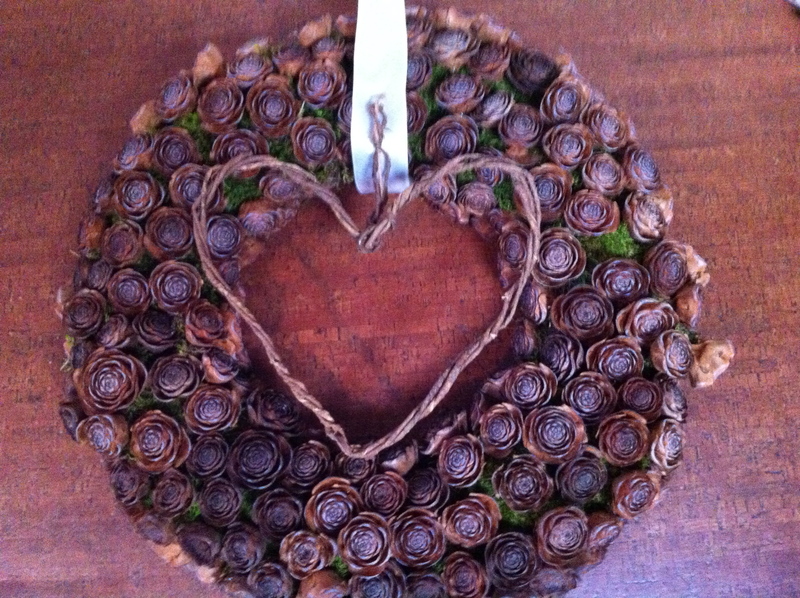 Take the bark covered wire and make a loose heart that just overlaps with the center of the wreath. This should give you a general idea of the length. Add a little extra to be safe. With the initial length in mind, triple up the wire. I found that the one wire by itself was too skinny. Now cut the wire and twist the three pieces together to make a vine like structure. The twist does not need to be perfect. The gaps will make it interesting when you add the berries. Start to form a heart shape with the vine. Make it so the point of the heart and the two curves overlap with the edge of the wreath. Again, do not worry about making it absolutely even. 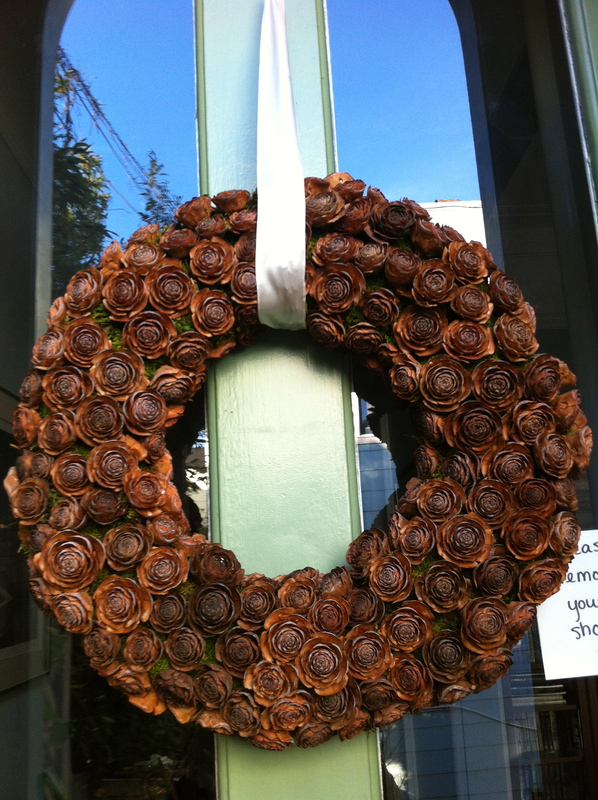 You want it to match with the natural elements on the rest of the wreath. However, do make sure it lies flat on the ground. Using your hot glue (yes, this is a lot of glue) make a tiny strip of glue on the front of the heart following the wire. Add two or three berries. Repeat this process until you cover the whole heart. The goal is to follow the lines of the wire so that you have spots where you have three berries next to each other and other spots where you just have two. 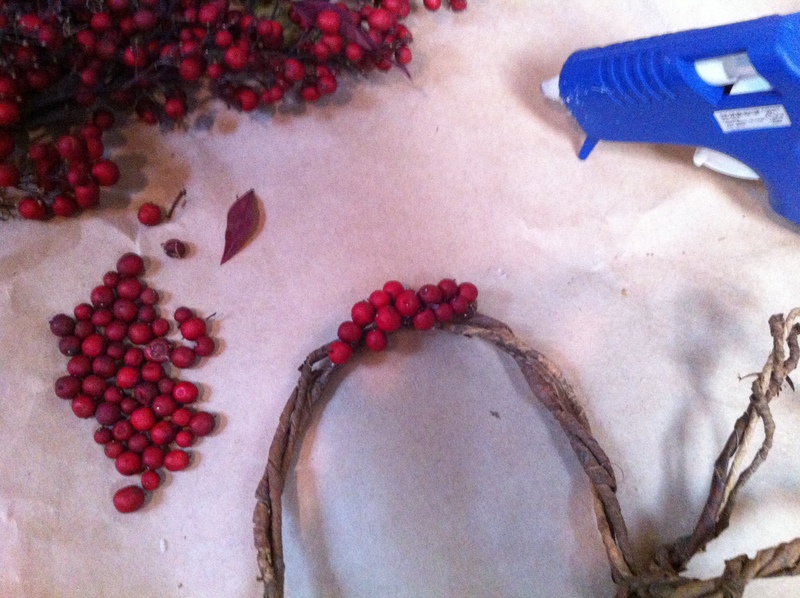 By laying the berries this way, you will keep the natural feel of a vine. Cut 3″ of the 24 gauge wire and bend it in half. Feed the open arch through the bottom point of the heart between the wires. Using your pliers twist the wire so it makes a tight wire stake. Repeat this process for the two arches. Take your finished heart and lay it on top of your wreath. You may need to temporarily remove a few of your wired pine cones to place it in. Using the three wires, secure the heart to the styrofoam. Add back in any removed pine cones. You may also need to re-glue any berries that came off during placement. Voilà! You have a Valentine’s Day wreath. I secured mine to my door using a loop of fishing line. Did you try making a wreath for the winter of Valentine’s Day? Have any questions? Let me know in the comments!